Rustic, small and narrow; at first glance Tortuguero is nothing outstanding. But on closer inspection, this village has tons of charm and surprises. Set between the Caribbean Sea and a series of canals, Tortuguero has emerged into a favorite among intrepid tourists who like its remoteness and proximity to amazing natural attractions. 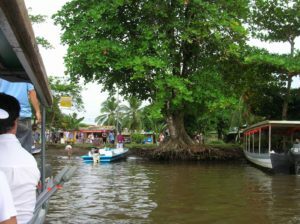 Reaching Tortuguero is an adventure in itself as you make your way here through an intercostal waterway by boat. The only alternative to this is taking a small plane. But the canal journey promises to be scenic. If you pay close attention, you can even spot wonderful wildlife along the way. The biggest draw of Tortuguero has got to be its National Park just adjacent to the village. Tortuguero National Park was primarily established to be the safe nesting grounds for turtles. This park’s name, which is the same as the village, actually means “turtle catcher”. 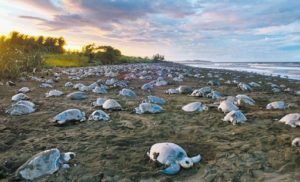 In this particular natural attraction, the Green Sea and Leatherback Turtles take the spotlight. They freely nest on the beaches protected by the park. There is a chance that you will see the nesting during the day, but most of the action happens at night. If you are unsure how to look for the turtles – not to worry – an official guide can bring you to the right spots. Please not that no tourist is permitted to go to the beach unaccompanied after 6 pm. If you are really lucky during your turtle watching excursion, you may see the newly hatched turtles make their way to the water. You can book the services of a guide through your hotel or a tourist kiosk in the middle of the village. Can’t get enough of the turtles? Drop by the Sea Turtle Conservancy Museum, situated in the northern tip of the village. This place is primarily a research center which also houses an interactive museum, a gift shop and offers biological courses and volunteer programs. Although the park encompasses many beaches, most of them are not suitable for swimming as the currents and surf are strong and rough, and the water is full of sharks. Fortunately, there are still varied activities to be enjoyed while here. There are naturalist guides residing in the village that are ready to show you the beautiful geographical and rich cultural gifts Tortuguero has to offer. Canoe and boat tours through the canals are always available. There are also hiking trails along the canals that you can tackle and lead you to animal sightings. Commonly spotted include various sorts of amphibians and birds of all kinds. And if being close to nature is something you strongly desire, you can also take on hiking through the jungle. One of the best walking trails in the area is the well-maintained Gavilan Trail, which stretches to 2 kilometers. Another hiking destination you should seriously consider is Tortuguero Hill, which is actually the highest point on the Caribbean side of Costa Rica. It rises to about 119 meters, and is about a 10-minute boat ride from Tortuguero. If you haven’t done this hike before, it is highly recommended that you hire the services of a guide, as some parts of the trail are hard to find. Guides can be hired from a small community called San Francisco, which just beside the hill. There are no cars in Tortuguero, and there is no real need for them as it is small enough for you to explore on foot. As for the eco lodges, most of them are located just outside the village. But take note that some lodges require you to take a boat ride to reach the village proper. Fortunately, water taxis are cheap with one-way ride costing approximately $2-$5 per person. Tortuguero National Park currently has an entrance fee. Guided tours are additional. For a map of Costa Rica, go here. For a page by page atlas of Costa Rica, go here.